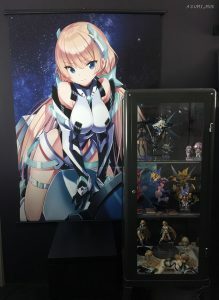 My Angela Balzac Merchandise Collection! 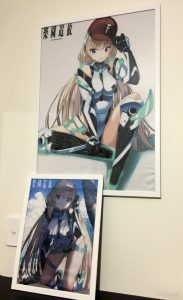 An overview of Angela Balzac merchandise from the anime movie, Rakuen Tsuihou: Expelled from Paradise. Includes figures, artbooks, magazines, clear files, tapestry, dakimakura body pillow covers and other miscellaneous goods such as stickers and card sleeves. 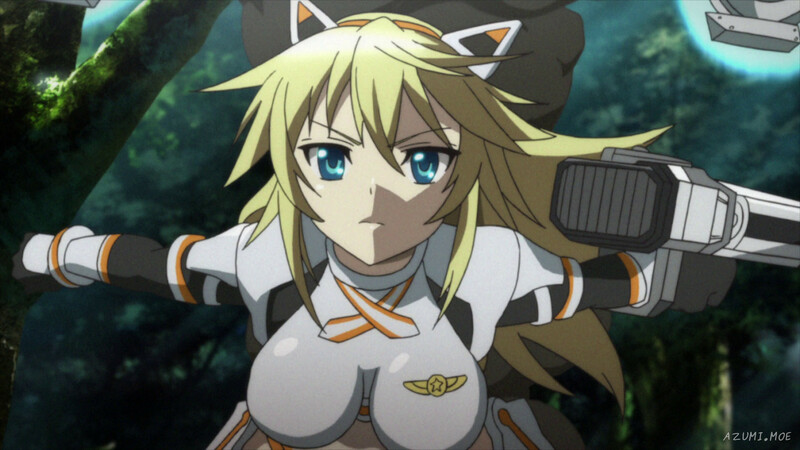 Angela Balzac is one of my most favourite anime characters. 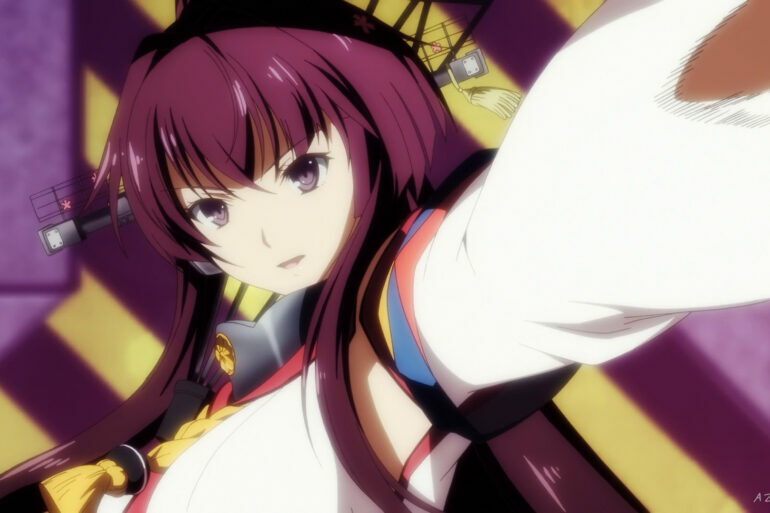 She is from the anime movie Rakuen Tsuihou: Expelled from Paradise. 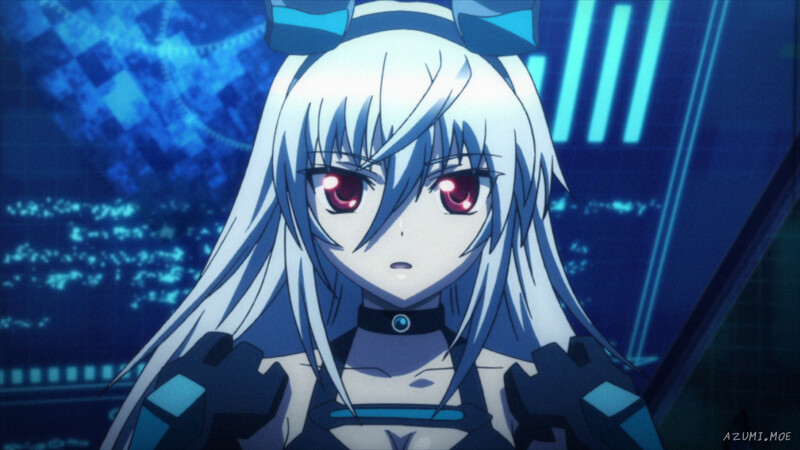 She is a tsundere, and admittedly her leotard bodysuit, futuristic boots and gloves are very nice to look at. 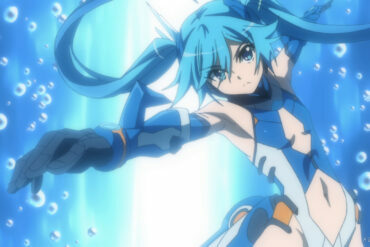 The movie was produced by Toei Animation and animated by Graphinica. 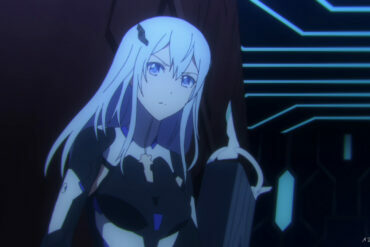 It was mostly a 3D movie but I think they did a great job bringing the DEVA Security girls and the Arhan mechs to life. 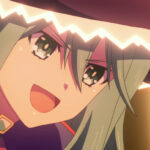 I think the creators really liked Angela Balzac, when you consider how much merchandise was released for her! 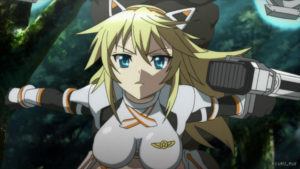 You can find dedicated screenshot galleries, visuals (clear files and calendars) of Angela Balzac and the other DEVA Security Girls (Christine Gillum, Hilde Thorwald and Veronica Kulikova) on those pages. 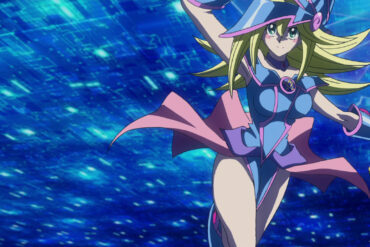 It would’ve been nice to see more of the DEVA Security girls. 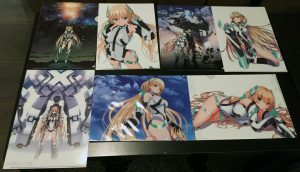 This is my collection of Angela Balzac clear files. They are a mix of A4, B5 and A5 sizes. 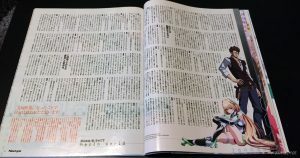 Below is not a clear file, it is a hard cover blank photo book. 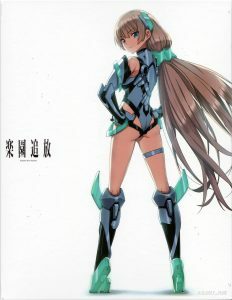 It features Angela Balzac full body view on the front cover, and a close-up on the back cover. 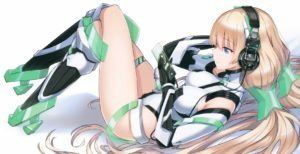 Full size views of all the clear files and calendar images above can be found on Angela Balzac’s dedicated page. Many of the calendar images were used for the wall tapestry designs. I placed them inside IKEA picture frames and they are on my bedroom wall. 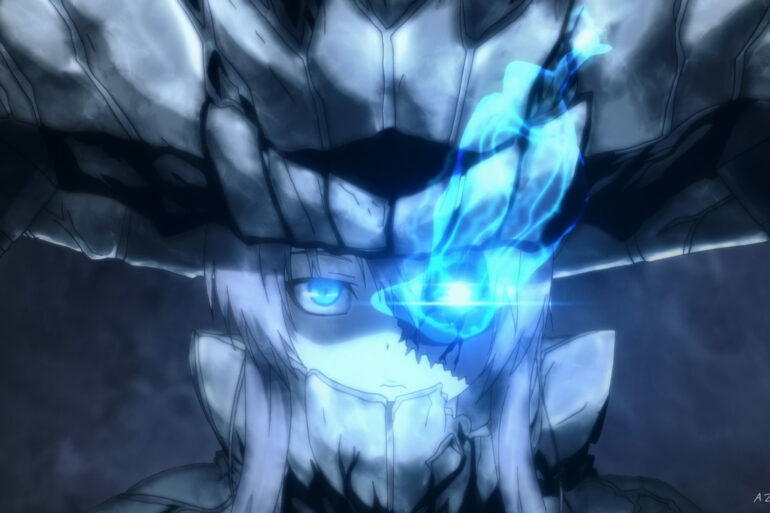 Also note there is a really large B2 size tapestry of one of the designs featuring Angela Balzac sitting inside her Arhan mech. There are some unique designs. 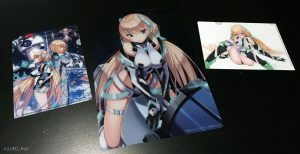 They include: Angela Balzac kneeling down at the beach (A3 size), Angela Balzac sitting down with Frontier Setter’s hat, and one of Angela Balzac and Super Sonico doing a reverse cosplay. 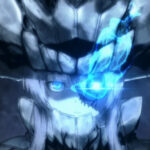 Super Sonico is a Nitroplus character. 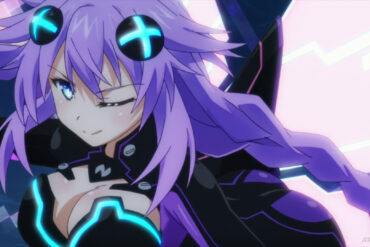 There was a collaboration between the two characters. There was also a chibi keychain of this collaboration, see the Miscellaneous Goods section below. 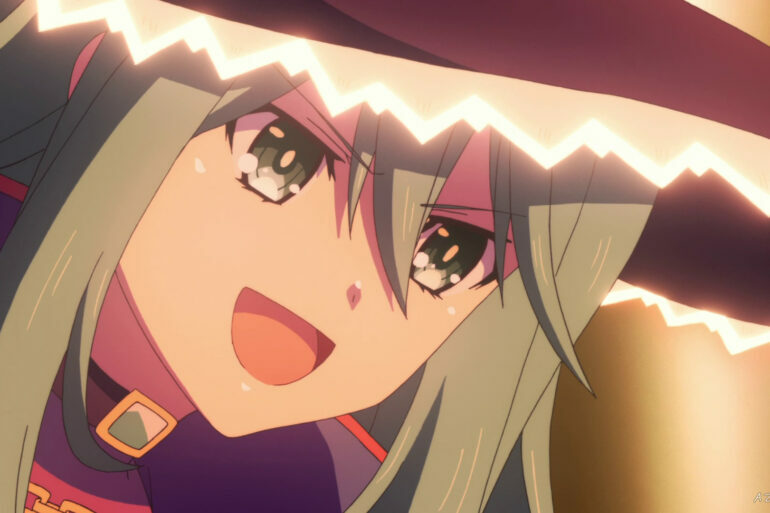 I really like the one of Angela with Frontier Setter’s hat, it is very cute. 🙂 And below is what they look like inside IKEA frames. I have yet to find a good location for the A3 tapestry. 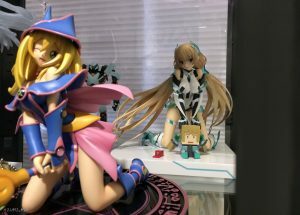 Angela Balzac received a lot of figure releases! From left to right: Figma, Alphamax, Max Faxtory, Petanko, New Vision Toys, Nendoroid and finally the large 1/4 FREEing figure. 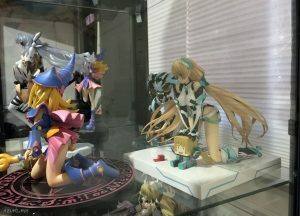 Another figure I placed in another cabinet is the Angela Balzac Phat! figure and New Arhan figure (Variable Action version). 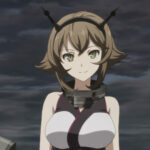 The large New Arhan figure by Good Smile Company was too expensive but I hope to get it one day. The Phat! figure is quite amusing because she is kneeling with her hands firmly pressed on a chibi digital persona of herself (the very same one she used to travel within DEVA’s systems). Two more figures which I haven’t unboxed yet are the chibi Medicchu version and the small Figgy set (you place them on your cup or noodles). You can see a photo of them in the next section below under Miscellaneous Goods. 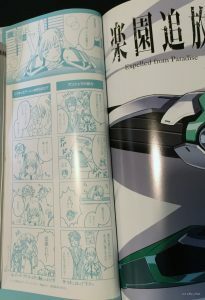 Below is a calendar, a pencil case, a booklet featuring screenshots of Angela eating her ramen and the two figures mentioned above (Medicchu and Figgy). And here are an assortment of other goods including card sleeves, character boxes, stickers, a Shikiki board, chibi keychains and post cards. Interestingly one of the post cards in the set is from another of Toei Animation’s anime titles: Kado: The Right Answer. 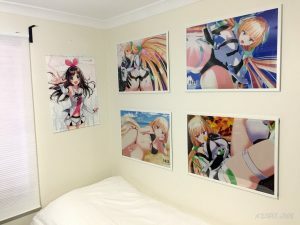 Angela Balzac received three Dakimakura releases! All three sizes are 160cm x 50cm and in all the designs she is wearing her DEVA bodysuit. 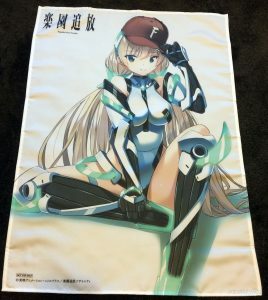 Bed version Dakimakura: this features Angela Balzac lying on a bedsheet. On the front side, her hands are above her head and her knees are against each other, and on the back side her hands are just above her shoulders. 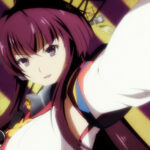 I like this one very much. Beach version Dakimakura: this features Angela Balzac laying on the beach with a shy expression. Her bodysuit and boots are wet from the water. On the front side her hands are on her chest, and on the back side her hand is on her buttock. This one is my favourite. 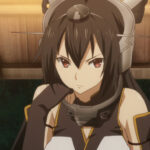 Below are two artbooks featuring extensive character designs and interviews. 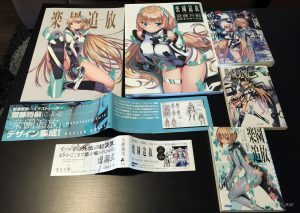 The artbook on the left is a limited release. The artbook on the right has a hardbook cover. 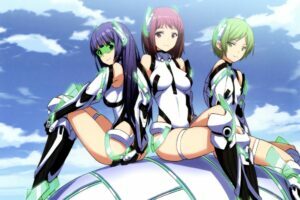 The light novels below are mission.0, the novel version of the movie and the sequel: Rakuen Tsuihou: Zankyo 2.0 Godspeed You. 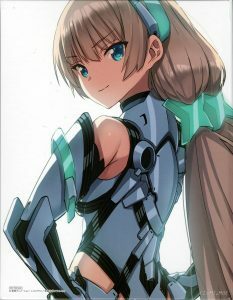 I hope to read the light novels as my Japanese improves in future. The limited release book contains some nice extras. 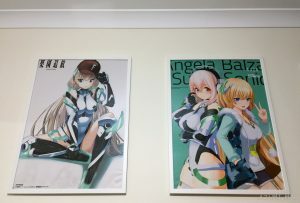 There is a mini poster of Angela Balzac, and behind it there is a Yonkoma manga comic. 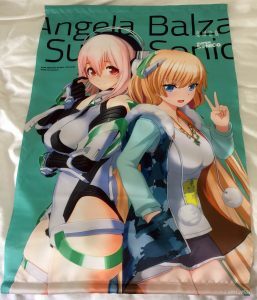 There is also a poster featuring Angela Balzac lying on a bed – the same design is used in one of the Dakimakura designs. And on the back of the poster, there is a photo of a model cosplaying Angela Balzac! 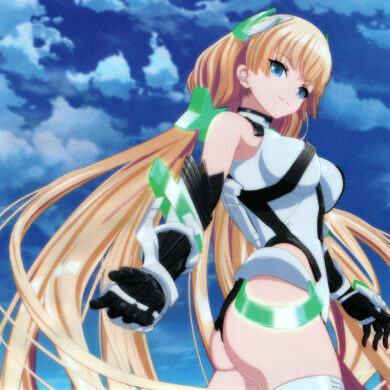 Rakuen Tsuihou: Expelled from Paradise was featured in several magazines. 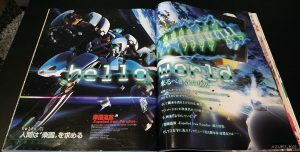 Two of them below are Newtype and CGWorld. 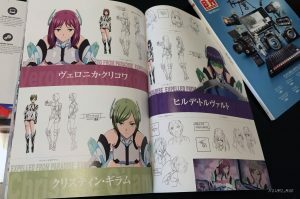 There is also another book below called 3DCG, which goes into a lot of technical detail on the animation style used in in the movie.